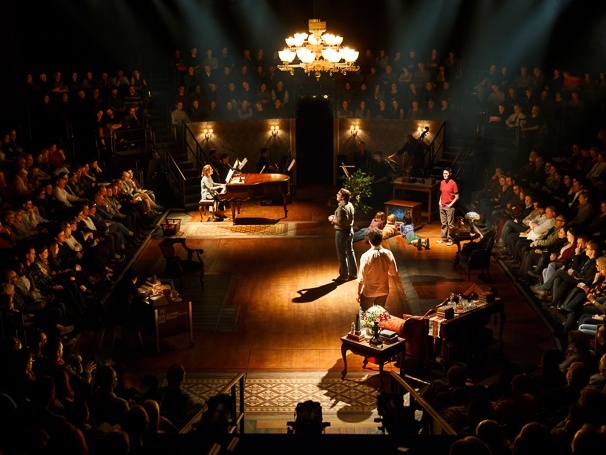 We interrupt our normally scheduled programming (aka the chronological order of the shows I’ve seen) to first talk about Fun Home because it’s too important. I’ve been waiting for this show all season. I know this might sound a little over-the-top, but I can’t help myself: it’s flawless. End of story. A musical like this only comes around once in a while (you can see highlights here). Consider me officially obsessed. 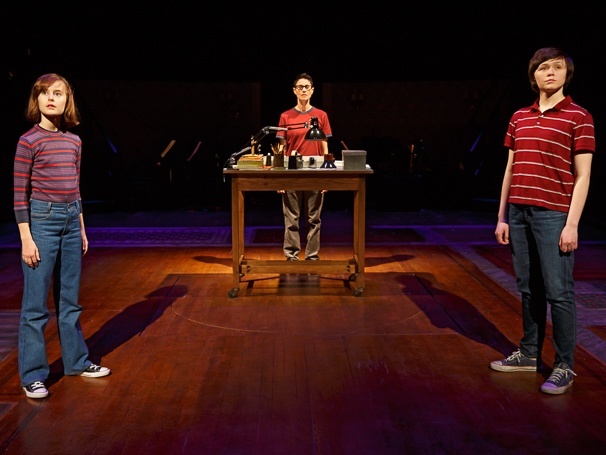 Some backstory: Fun Home is based on the graphic novel “Fun Home: A Family Tragicomic” by cartoonist Alison Bechdel about her relationship with her closeted father. The name Bechdel might ring a bell if you’re familiar with the Bechdel test or the comic strip “Dykes to Watch Out For.” Nevertheless, you’re about to get to know Alison and her family very well as she looks back on her childhood and teenage years, building a timeline and attempting to unlock (and draw) the mystery of her father. We meet her at three different stages: Young Alison is nine or so, Medium Alison a freshman in college, and current-day 43-year-old Alison. Present-day Alison doesn’t quite narrate; rather she excavates her past with the audience in tow. As she sifts through her dad’s old things, she pieces together memories to literally draw from them and make a cartoon. And then she captions the different moments, casting a new light or interpretation on them whenever possible. “Caption: Dad and I both grew up in the same small Pennsylvania town. And he was gay, and I was gay.” Through her eyes, we quickly fall into this world of memories. It’s additionally effective because the production is performed in the round; company and audience, we’re all in this together. The set pieces spin and shift and disappear through the floor as we move through time. Like the recent production of The Glass Menagerie, the design does an excellent job of creating a memory piece (shout-out to Associate Scenic Designer Tim McMath who designed our gorgeous Summertime set). And within the in-the-round theatre, we meet fully developed, three-dimensional characters, and the fact that they’re based on a real family makes the experience all the more visceral. Each performance is more fantastic than the last. The chillingly good Tony-nominated Michael Cerveris loses himself in Bruce, Alison’s father – his inner pain radiating from every move, every smile or outburst, every awkward attempt to connect or push people away. The same goes for Tony-nominated Judy Kuhn’s poignant, understated performance as Alison’s mother, Helen. And the three Tony-nominated women who play Alison each bring something unique and beautiful to the role. Eleven-year-old Sydney Lucas plays Young Alison, and all I want to know is where did this girl come from?! She’s stellar and changes everything when she sings THIS (it will also be the Tony performance on Sunday). Emily Skeggs brings an infectious, wide-eyed joy to Medium Alison as she discovers her sexuality. And Beth Malone as adult Alison is the center of this show, keeping everyone and everything grounded. From the moment she starts speaking, you know you’re in good hands. Here is one of my theories about musicals. If it has a bad score, it dies, it’s forgotten. If it has a great score and not the strongest book, it’s forgiven. As long as it’s got that score, people let the bad, typically contrived, book slide. So when a musical comes along with a book that’s just as strong as the score, if not stronger, it leaves a mark. Shows that meet this criteria stand out (think Sweeney Todd, Next to Normal). So bless you Lisa Kron for this book and lyrics, and Jeanine Tesori – whose music doesn’t always click with me – for writing a beautiful score that I’ve been listening to nonstop since Monday evening. The story weaves seamlessly in and out of song and spoken word (hear the nominee hopefuls discuss the music and lyrics here). As for Sunday’s awards, there are legit races this year with no clear frontrunner in multiple categories. And as far as Best Musical goes, Fun Home wins in my book, hands-down, but An American in Paris (truly gorgeous, review to come) may have the edge. We’ll have to tune in to find out how the chips fall. Regardless of who wins, this is an intimate, heart-wrenching, funny, true-to-life story of love, self-denial, self-discovery, and above all, family. Caption: Get your tickets, and come on home.